Today's businesses depend on their databases to provide information essential for their day-to-day operations and to help them take advantage of today's rapidly growing and maturing electronic commerce opportunities. The primary responsibility for the design and maintenance of these databases rests with a company's information technology department. 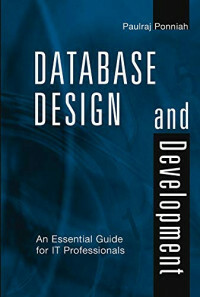 Unlike other IT resources currently available that tend to focus on a particular product, Database Design and Development: An Essential Guide for IT Professionals was created to give today's IT directors and other IT staff a solid basic knowledge of database design and development to help them make educated decisions about the right database environment for their companies. Today's IT professionals must understand the fundamentals in order to determine their next steps for specializing in the vast field of database technology. What's involved in effective database management and maintenance? With more than twenty-five years of experience teaching IT courses and designing databases for some of America's top institutions, the author has succeeded in creating an essential resource for today's IT managers as well as for students planning a career in information technology.